What to expect for the cruise? Apart from the dinner buffet, you can also enjoy live music and dance your night away while indulging yourself in the gorgeous Victoria Harbour view. Is the cruise fully air-conditioned? Yes. The dining banquet floor is air-conditioned. Yet, you can also get some fresh air at the open observation deck. We welcome passengers with wheelchairs. However, considering the pier premise and the vessel are not designed or constructed as to be accessible to persons with disability, the cruise may not be handicap accessible. Can I smoke in the vessel? For safety reason, smoking is prohibited in the entire vessel. Our cruise is more relaxed and casual attire is fine. It is highly unlikely. Bauhinia is a rather large vessel which steers stably in the Victoria Harbour. No. There is no age requirement. But all children must be accompanied by adults on board. Can I bring any pet with me to the vessel? No. No livestock or pets are allowed on the vessel, with the exception of guide dogs. We do not wait for any passengers beyond the designated departure time. Even in the case of a few passengers within a group are running late, the vessel will not wait for them to join the cruise, hence we request all passengers to arrive at the designated boarding time to ensure we depart on time. No refund or credit will be issued for passengers that do not board the cruise on time. What size group can the Bauhinia accommodate? Each of our vessels can accommodate up to 350 passengers. Bringing your own food and drinks are not allowed. Beverages can be purchased on board. Please check out our drink list here. Click to view the Drink Menu. Does Bauhinia cater to special dietary requirements? We do not offer special dietary menus. The buffet menu is designed for the majority of guest expectations; it includes choices for vegetarian and halal. Please understand that due to the scale of the operation, we cannot give an absolute guarantee that certain ingredients will not be in our food and the company explicitly accepts no liability. For serious food allergies, we advise our customers to make their own decisions on selecting their dishes from the buffet. What beverages are served on cruise? Coffee, tea and drinking water are included in the buffet. Any additional beverages may be purchased on board at our cash bar. Can I bring a birthday cake on board? Is there a fee for cake cutting? Yes. A fee of HK$100 plus 10% service charge is charged per cake. We would like to have some celebration for my family and friends on board; can you make any special arrangement? Yes. It’s our pleasure to make your celebration memorable. Our live band can sing your requested songs, and our chefs can prepare a celebration cake subject to additional charge. Please contact us and let us know beforehand. Can I bring my own wine? Is there a corkage charge? Yes. A corkage charge of HK$150 NET per bottle of self-brought wine or liquor (750 ml or less) is applied. Yes. Advance reservation is required. When should I make the booking? To avoid disappointment, we highly recommend you make your booking as soon as possible or at least 1 day in advance of your boarding date. We do not accept on day online reservation, but please call us at +852 2802 2886 to check seats’ availability. We accept cash and major credit cards: VISA, MasterCard, American Express, as well as Unionpay. Once your booking is confirmed, we normally do not accept changes. But in the case of any special reasons or emergencies, please contact us. Yet, Harbour Cruise – Bauhinia reserves the right to make final decision. Do I need to bring and present printed ticket? Your name will be on our guest list. In case of any confusion we may ask you to show your ticket. Yes but it is subject to seats availability. Can I cancel my booking? Is there any refund? We regret there are no refunds or exchanges once a booking is confirmed. In the rare case that the cruise has to be cancelled because of weather, we will contact you to make other arrangements. I have a large group size for over 150 people; can I join the dinner cruise? Any group size less than 150 people can join our dinner cruises (Pearl of Orient or A Symphony of Lights). However, any group size over 150 persons will be treated and charged as per our "Charter Cruises - Price List" Click to view the Price List. Can I hire the vessel for a private event? Absolutely. Please fill in our online enquiry form or you can call us at +852 2802 2886 for more information. 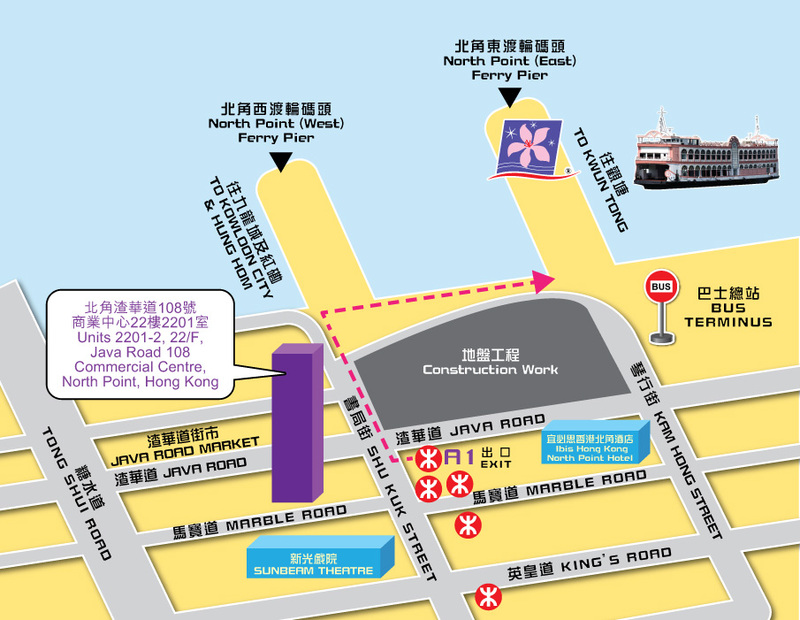 By Mass Transit Railway (MTR): Please take the MTR to the North Point station (Island line) and take the Exit A1. Our pier is 3-minute walk away. Reference route map here [MAP]. By Taxi: Please get off at the intersection of Java Road and Kam Hong Street or Shu Kuk Street, and walk to the pier which is 2-minute away. By Mass Transit Railway (MTR): Please take the MTR to Whampoa station (Kwun Tong line) and take the Exit C2. Our pier is 5 to 8 minutes’ walk away. Reference route map here [MAP]. Unfortunately, there is no parking space available. Where is the closest private parking space? 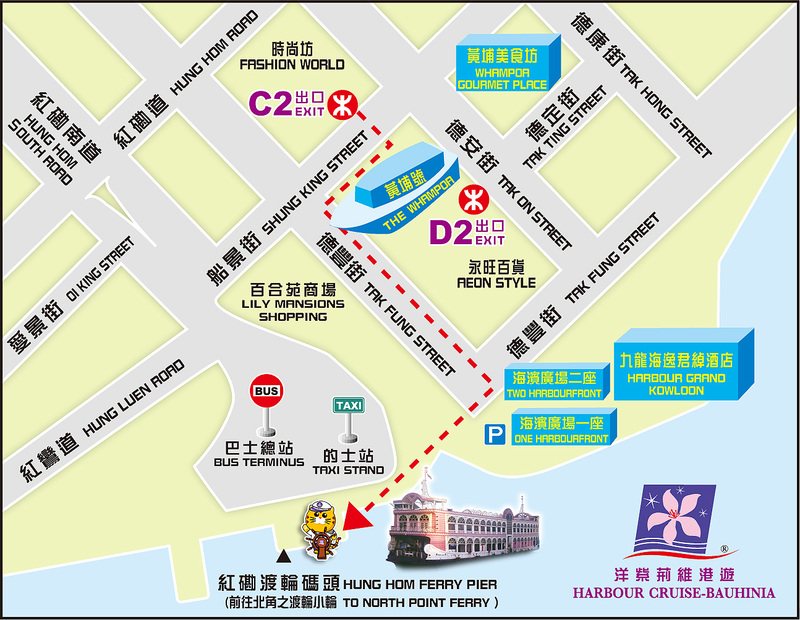 North Point: The closest private parking is located at Wealthy Court or Fitfort. Hung Hom: The closet private parking spaces are Wonderful Worlds of Whampoa and The Harbourfront. Our staff members will pass you a table number at the registration counter. As you board, our captain and crew will direct you to your seats. Can I get a private table? Anywhere from 2-10 people may be seated at one table, depending on the total number of individuals on the vessel. You may need to share tables with other guests. Unfortunately this is not possible. Due to the fact that the exact table configuration depends on the different group sizes of the people making reservations we cannot work with fixed table reservations. We can therefore also not guarantee a table at a specific location in the vessel. You can make a remark or notify our staff member during your reservation. We will try to accommodate your request. I have a large group size; can you set up a partition and separate us from other guests? Unfortunately this is not possible because the vessel is not configured to set up any temporary partition because of safety reason. But if your party requires more than one table, we will try to locate you and your guests next to each other. We basically cruise in most weather conditions all-year round, and remain our operation during yellow, red and black rainstorm signals, and typhoon signal no.1 and 3. What about if there is tropical cyclones warning No. 8 or above? What is the arrangement? If the signal is lowered before 12:00 pm, the service will be held as scheduled. If the signal is lowered between 12:00 pm to 3:00 pm, “A Symphony of Lights” Dinner Cruise or other services’ last sailing will operate as usual. If the signal is lowered after 3:00 pm, all dinner cruises and services will be cancelled. We will contact you, and you can choose to reschedule or to receive a full refund. Will the cruise be cancelled after booking? In the case of an unforeseen event, due to which the cruise cannot take place, we will contact you and you can choose to reschedule or to receive a full refund.